Mary Ann Connelly Wade, age seventy-four, resident of Orlando, OK slipped away to join her husband with Jesus on Wednesday, November 14, 2018. Mary Ann was born on July 19, 1944 to Virgil C. and Emogene Marie (Glover) Connelly in Oklahoma City. She attended Moore High School, but graduated from Lexington High School in 1962. Armed with her high school diploma, she paid for three college degrees from Oklahoma State University--those of her husband, daughter and son. She entered the workforce at the Cleveland County Clerk’s office, and retired as an administrative assistant at Lambert Construction Company in 2007. Mary Ann spent the largest part of her life living, working, and painting on the farm. Ever resourceful, Mary Ann was proud of making the first farm payment in 1971 by selling a slew of bottle-fed calves. During her retirement she enjoyed traveling with her husband, Sam, and their eight grandchildren. She also loved teaching art to students at Mulhall-Orlando Public Schools. She was a past president of the Stillwater Art Guild. Her easel at the farm held a blank canvas for the next painting she was planning. Viewing will be at Trout Funeral Home of Perry on Tuesday, November 20 from 8 a.m. to 8 p.m. with family visitation from 5 p.m. to 7 p.m. A celebration of Mary Ann’s life will be held at 10:00 a.m. on Wednesday, November 21, 2018 at the Orlando United Methodist Church with Reverend Adrian Pollard and Reverend Ronnie Hopkins officiating. Burial will follow at Resthaven Memorial Gardens in Oklahoma City, OK. Preceding Mary Ann in death were her parents, Virgil and Emogene Connelly, and her husband of fifty-six years, Sam Wade. Survivors include her children and their families, Lavonna and Ronnie Hopkins of Woodward; and Connelly and Jennie Wade of Perry; her grandchildren, Erin and Dakota Davis of Alva; Rachael, Jessica, and Samantha Hopkins of Fairview; Nathan, Karlie, Allie, and Eva Wade of Perry; her sisters Kathleen Connelly of Moore, and Melissa and Butch Maine of Canon City, CO; sisters-in-law Anita Dees of New London, CT, and Carla Smith of Round Rock, TX; along with many well-loved cousins, nieces and nephews, as well as neighbors and friends too numerous to count-including all those at Stillwater Cancer Center. Memorial contributions may be made to the Orlando United Methodist Church Building Fund, in care of Trout Funeral Home of Perry, 1408 N. 7th St., Perry, OK 73077. 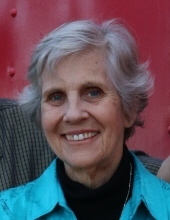 The family would like for you to share your memories of Mary Ann at www.troutperry.com. To send flowers or a remembrance gift to the family of Mary Ann Wade, please visit our Tribute Store. Famiy will meet with friends from 5:00 p.m. to 7:00 p.m.
"Email Address" would like to share the life celebration of Mary Ann Wade. Click on the "link" to go to share a favorite memory or leave a condolence message for the family.